Backlash or not, Hardware problem or not? Posted September 25, 2018 · Backlash or not, Hardware problem or not? I have seen this problem more less on my previous objects, but didn't gave them too much attention. Last week I found a play at one of the axles and did the whole process of loosen all pulleys, squared the axles during the retightening of the pulleys and printed a cube afterwards. Everything seemed fine. But the test object (cube) was not the best test for this specific problem below. Yesterday I printed a simple model and found again a very strange "misalignment" of the layer, after the print direction (clockwise, counter-clockwise) is changing. So I understand why this happens, because of the change in the direction, something will be misaligned a little bit (backlash) but I have no more idea how to fix it. The printer (UM3) is 2 months old, I checked the tension of the long belts, seems ok for me, all 4 belt have the same tension. I opened all pulleys, and squared the axles with the tool found on YouMagine. I loosened the stepper motors and retightened them. Both short belts have the same tension. I checked if there is some friction when moving the head around and lubricated the axles a little bit. I also checked if I can move the nozzle when touching it, to see if there is a play or some problem, but nothing. I have this issue on other models, with a hole in it for example as well. 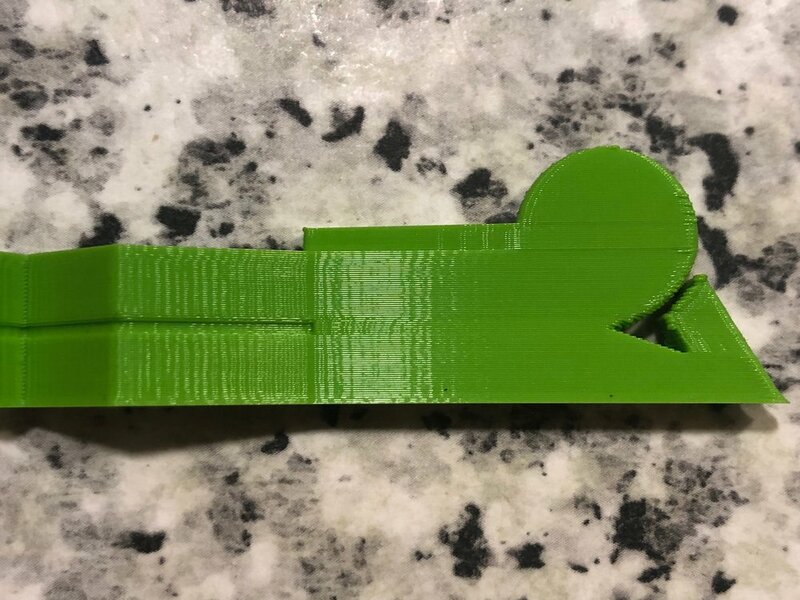 (there is currently also another thread with someone else with the same problem, but I don't want to hijack his thread) So every time, when there is something in the model, a hole, a step, or whatever, and the print direction is changing to another direction, I get these results. Here are two pictures of the model and I marked the problems. There are other things as well on this model and due the zoom of the picture it looks more worse than it is actually. So reducing speed helps a little bit, but not too much. Is there anything else I can do on the hardware side? I did, to be on the safe side, the whole process again with the pulleys and the axles, but I could not check the result yet. Printing slower and same speed for all speed values, will help, I am sure, but to get rid completely I assume I have print with 20mm/sec or less. Do you have any other advise for this problem. One more thing I have to mention, die misalignment is only on the front, the back looks normal, I am even more confused. If this would be backlash, it should be visible on the backside also? Or not? Posted September 25, 2018 (edited) · Backlash or not, Hardware problem or not? I am near not to having this problem using other slicers (actually slic3r gives the best result), firmware jerk controls to 4-5 help a really bit too. I still have underextrusion at the starting or ending layer where there is an hole inside the model, and this happens the most with cura too. So just to understand better this problem, reduce jerk settings and try another slicer. Thanks for your hint and yes I will try another slicer. I am sure (ok not 100%) that this could not be a mechanical problem anymore. Too much users have the same problem and most of them have checked tension and play. I have seen today a video of a Prusa i3 MK3 problem, which looks similar and the Prusa community means that it is inconstant extrusion or even under extrusion. 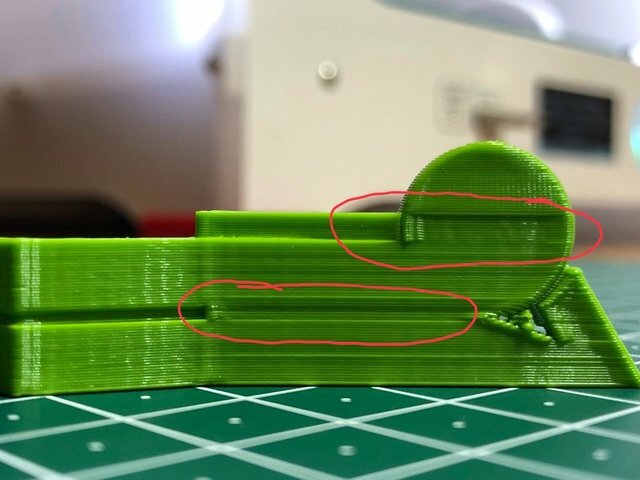 So maybe our problem here has nothing to do with shifting the layer after a change in the direction and could also be something like under/over extrusion. In my understanding, when it would be plain layer shifting, then the same must be visible on the other/back side as well. I honestly highly doubt it is 100% hardware related. 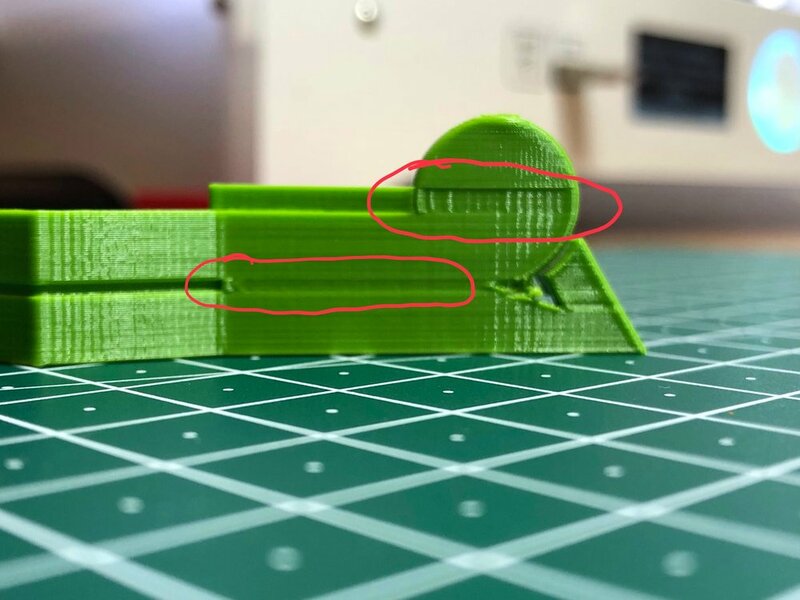 I have a cr-10s and the amount of layer shift / underextrusion is exacly the same, so being 2 completely different machines, being an hardware fault I would expect to see one to be less or more visible than the other. Same as you, tensioning the belts and screws or the extruder differently don't change the effect at all, only changing the slicer really does. 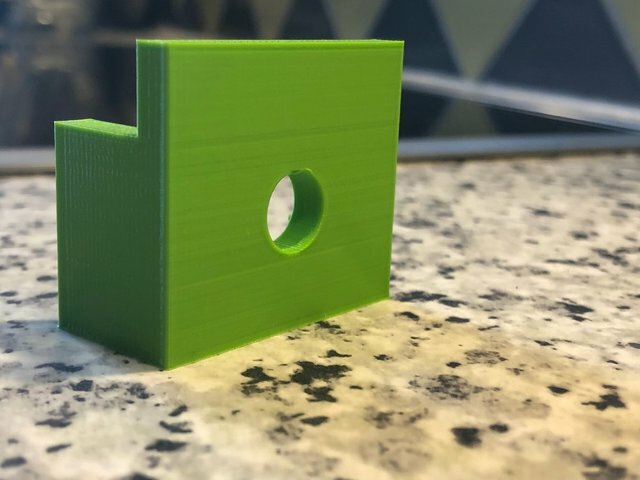 Online I remember someone mention this started happening after cura 2.6.1, you may try with that or the version before it maybe. That sounds "good" because I am at the end with my ideas what to check or fix mechanical. 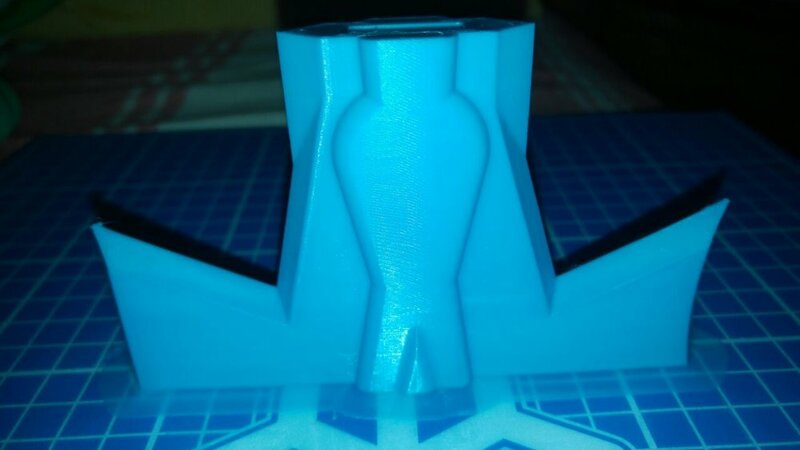 I will try (hopefully today in the evening) a new slicer and also the beta of Cura 3.5 maybe there is also a difference. 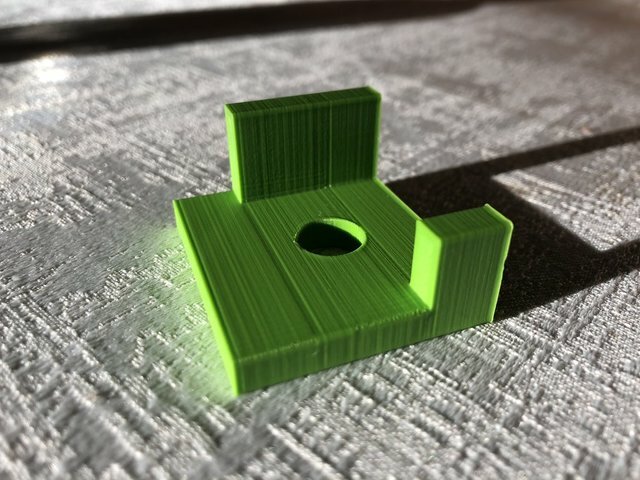 For me with the UM3 it would be the best to use Cura, because everything is working fine together. Another slicer means, that it is less comfortable in the daily usage. But let's see, with a test I can narrow down the problem hopefully. 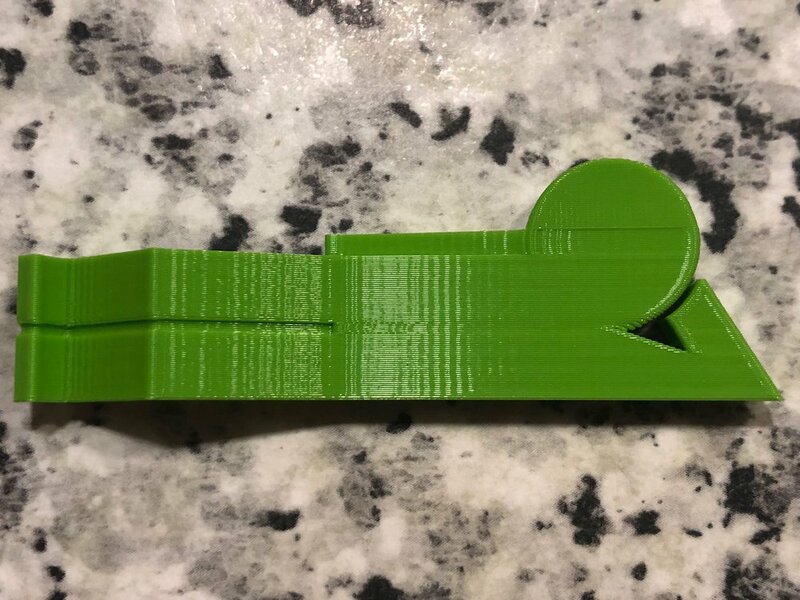 This is the only issue leftover using Slic3r, watch the photo and you will notice when there is an huge variation of the section, near the edge on the same layer where the section is bigger there is an underextrusion. I say this because I think it is related to the issue you and me are having. 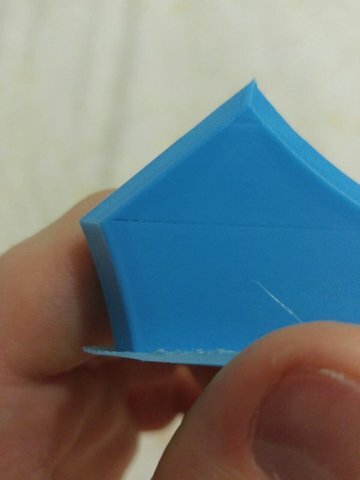 Using cura that layer is completely separated and the top and bottom part will completely split. Just to be sure, it is really "the slicer" and not a minor setting anywhere which makes the different. But I believe you checked it. On the other side, if it is really Cura, all others should have the problem as well. 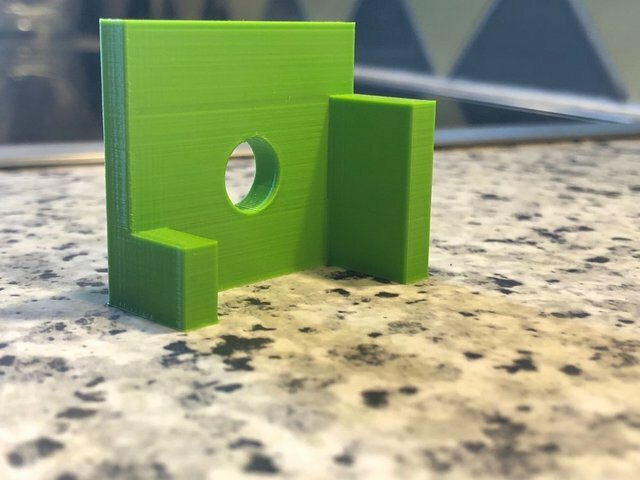 Ok there are a lot of people having this issue and others who print mainly artistic models and they will probably not see this issue, but there are also a lot of people here, printing straight technical parts and using Cura. So maybe they found a good setting or are printing so slow, that the problem will not occur or not in that manner that it is such an eye catcher. Cura and slic3r have much different functions, but the one that are shared are all set the same. If it was just a temperature issue, it wouldn't explain why it only happens on the biggest section variation, being the smallest section or the biggest depending where it is placed. In case of an internal hole, if the hole is vertical it happens on 2 layers only, the top and bottom one. If the hole is horizontal like in your photos, it happens in all the layers between those 2 top and bottom layers. Someone more acknlowledged about the slicing process and what is done when sections change like that may rule out the possible causes, but I am currently out of ideas. but I am currently out of ideas. Posted September 26, 2018 · Backlash or not, Hardware problem or not? I printed yesterday, after my calibration in the morning again a test object, same settings as before, just to see if there are differences after another round of belt tensioning and squaring. No - same result. Then I did a test with decreased jerk setting from default 25 to 12. But again, same result. There is also no visible difference between the object printed with 25 jerk, to the one with 12 jerk. And I checked the the object under the magnifier and have seen that the layer has a identical shift in back as at the front. So it cannot be a "normal" layer shift, because then the layer would be going outwards in the back when the front goes in. But it's the same, the layer comes goes in, in the back and at the front, so the object is thinner in the area where the problem occurs. Very very strange. In the layer view in Cura, everything look good and normal. Anyway, today in the evening I will try another slicer as advised - and will post my results. Posted September 26, 2018 (edited) · Backlash or not, Hardware problem or not? And I checked the the object under the magnifier ﻿and have seen that the layer has a identical shift in back as at the front. So it cannot be a "normal" layer shift, because then the layer would be going outwards in the back when the front goes in. But it's the same, the layer comes goes in, in the back and at the front, so the object is thinner in the area where the problem occurs. Very very strange. I tried again with slic3r another object, with the same result as before. the mid variation section has an half missing layer (underextrusion? Not really since it completely misses that line so you can see the other part of the wall and all the internal piece) near the edge, as I explaided before it is the seme problem as your, depending on the shape and vertical or horizontal position of it. As I said with cura this underextrusion is more evident, but anyway I asked a friend to try the gcodes I used for the previous and this model print and he doesn't have this underextrusion in those layers. It is really strange, since I have the jerk to 2 but 10 doesn't make any difference either. I think cura and slic3r use different movements to print the item, and a weird movement happens when crossing an edge and on the previous or even next layer (like in this last case) the section is much different. 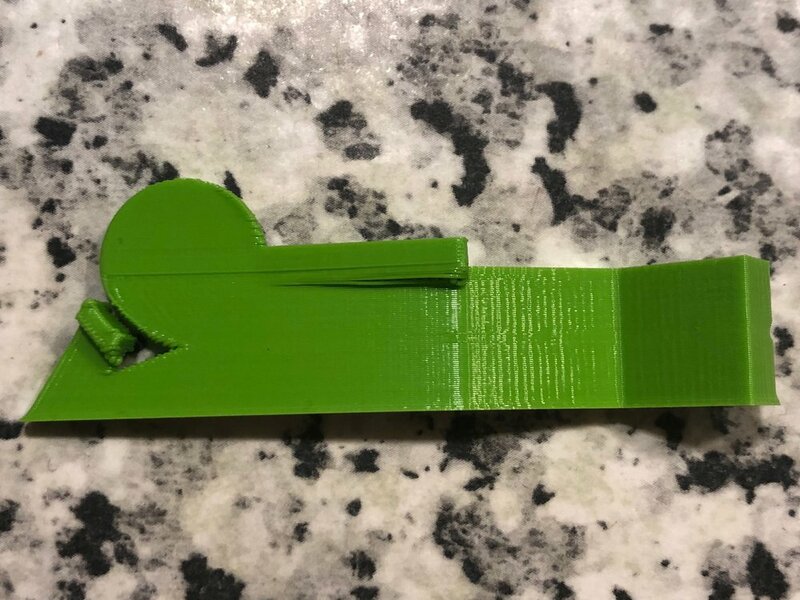 I would try to have all the time the fan off to help the adhesion, but it would make it impossible to print the infill, so it is a problem since no one slicer has an option to use a different fan speed for the perimeter and the infill. I asked a friend to try the gcodes I used for the previous and this model print and he doesn't have this underextrusion in those layers. He has the same printer as me, a cr-10s. Other things may slightly hep could be finding the right Z height proportion to use depending on the gears and stepper motors. For the cr-10 for example it is better to change the layer height by 0.04mm, so 0.16, 0.20, 0.24 and so on. I can't find the right differences to use for your printer, you should ask someone here. Then the retraction may be helpful too. I found the speed has the most important role for bowden extruders. I actually have it set at 75mm/s with 8.5 mm. The z-hop when retraction is at 0.5mm, and the min and max fan speed too. For PLA I am using 50 to 80% fan speed, though disabling it for the walls and maxing them for the infill could be the best thing ever. The infill is to be done for last, in the photo I posted I did " Internal wall -> External wall -> Infill" and the infill shell disappeared. Now I am trying to do "External wall -> Internal Wall -> Infill" to see if it may change that delamination issue. All of this after having correctly calibrated X,Y,Z and extruder esteps and flow of course. 2 Stepper dampers for X and 2 for Y axis may help too. Don't try to use them for the Z and the extruder, though. 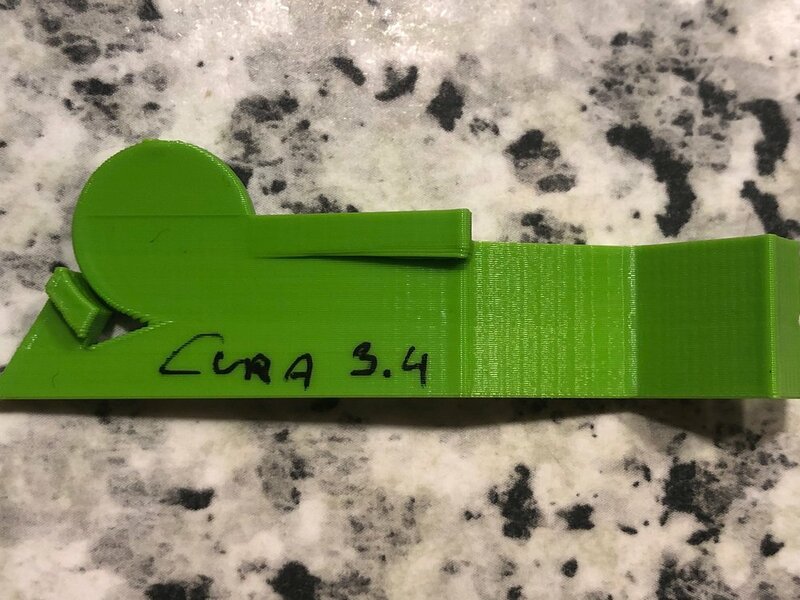 Print with Cura 3.5 beta, just to see if there was something changed, but the result is exactly the same as with Cura 3.4. Then I printed the same object with Simplify3D. Same layer height as in Cura, but printed a little bit colder than with Cura, because default settings in S3D are 195 for PLA. Speed settings are completely different to set, so I used the defaults for S3D "Medium quality" profile. Here are the results of both and for each front/back side. 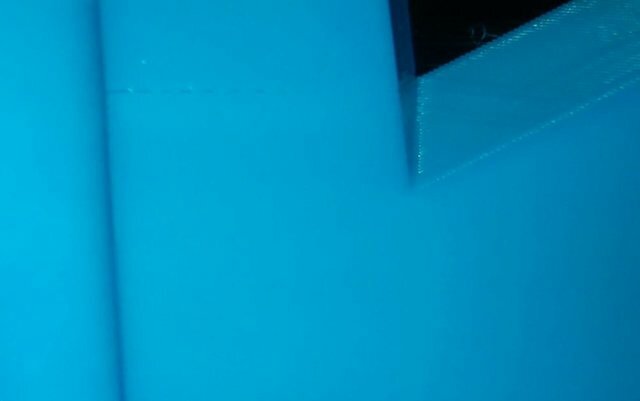 The problematic areas (head) are still there, maybe a little bit less than in Cura, but still visible and you can also feel the step on both sides with the finger. On the picture it seems more less visible, but thats due the light. So I have to play with other settings (Cura preferred) to get a better result. I will try now a test with same speed for all speed settings and try also more different jerk/acceleration settings. Posted September 27, 2018 · Backlash or not, Hardware problem or not? The result when printing with 35mm/sec for all relevant speed settings makes no difference - same output. Then I have tried to rotate the object on the build plate for 90° to see if there is any difference - no, same result. So with this test I can be sure, that it has nothing to do with belts or any mechanical issues. I created another test object and printed again with same speed of 35mm/sec for everything. The result is not bad, I cannot see any issues caused by the hole, but there are still fine disorders due the two side walls. And these disorders are for a few layers and trough the whole object, so you can see it on the back and on the front. The layers are not shifted, so the disordered layers goes in on the front and on the back, so the thickness is when measured in these disordered layers a little bit smaller than then rest. I still have the exact same issue as you. When I printed slower the hole didn't cause an issue anymore. The layers for me also have disorders but I don't know what the cause of this is yet. 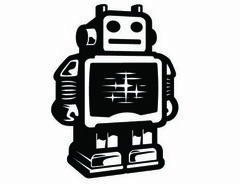 Which 3D printer do you have? I use an Ultimaker 3 and I am nearly out of ideas. Have tried a lot of settings and also another slicer. I mean this test object is not bad, the picture shows more disorders than just with your eyes, but still not sure if this is normal or if I have to worry about it or tweak my settings. Posted September 27, 2018 (edited) · Backlash or not, Hardware problem or not? But if someone want to help and test it, this is the STL of the lying man with the disorder in his head. Just print it as it, without supports. A colleague of mine has tried it now on an Anet 8, sliced with Cura with the same result. So it is a slicer problem? I doubt that? No it isn't, I tried yesterday Cura, Cura Beta and Simplify3D and all 3 shows the same problem. I also tried to rotate the object on the bed for 90° to see if this helps, but still the same.